Kabaddi has the potential to become a globally popular sport. Prokabaddi League (PKL)– An IPL like version of the Kabaddi for the fans exclusively for the resurrection of Kabaddi was started in 2014; a venture by Mashal Sports and their director Charu Sharma ably supported by Star Sports. After the success of Season 1, 70% of Mashal Sports was bought by Star Sports who are working very hard to bring back Kabaddi to glory. PKL Season 1 had an unbelievable viewership of 552 million, second only to IPL. PKL grew 20% YoY from season 1 to 2 and 35% YoY from season 2 to 3. This spurt in growth resulted in the introduction of 2 seasons / year format with 2016 having Season 3 & 4 just 4 months apart. The exponential rise in the viewership and fan-base shows that people enjoy watching Kabaddi. 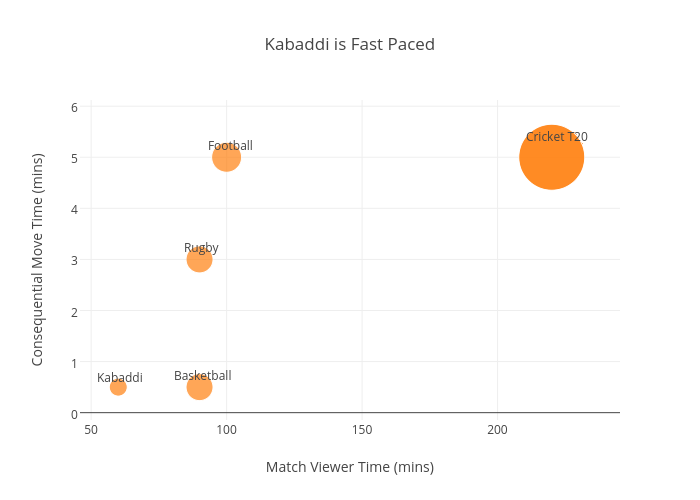 The growing interest for Kabaddi in India (as well as personal interest) has made us analyze how Kabaddi clicked through Prokabaddi as it has the second highest viewership after Cricket in India. The average time a viewer needs to spend watching a Kabaddi match is much shorter than most other team sports. Given the global popularity of Football and Basketball compared to more time consuming team sports like Cricket and Baseball, it is obvious that match time may be inversely proportional to potential viewership [of course with a minimum cutoff]. Lets also look at the pace of the game. Pace of the game can be defined as the time taken to complete a portion of the game. For e.g. Delivery of a ball in Cricket, Goal-kick to the opposition goal post, a basket in Basketball etc. It can also be interpreted as the time taken in a match for a significant event (a goal, a wicket, a home-run etc.) to happen. A wicket or a great shot or a significant fielding effort in Cricket occurs once an over, takes 5-7 minutes. A good move takes 1-5 minutes in Football. In Kabaddi, by definition, every 30 seconds there is raid or tackle, often very intense, can be missed in a blink. Introduction of do-or-die raids has enforced the pace of the game – to at least have one consequential raid every 5 raids – that is a maximum of 2 minutes, 30 seconds. Kabaddi is a fast paced game. The excitement and thrill provided by the game has made it a timeless sport which has survived in India for the past 2000 years. It requires no equipment and one can play it anywhere. And it doesn’t cost anything! Kabaddi can only be compared with football, whose popularity in African and South American countries can be largely attributed to the low costs required to play the game. For lay person to play Cricket, the minimum investment is a cricket bat and a ball. Same goes with baseball. With football and rugby, you need at least a ball and in Basketball you need a hoop in addition to the ball. On the other hand, Kabaddi requires nothing but a willingness to play! If an international match is considered, the necessary requirements are a mat, few safety equipments like knee cap and ankle cap and the match is good to go. Any comparison will show that the expense needed to play Kabaddi will be very meager compared to any other sports. Often when more players are involved in game action, the strategy and tactics takes on greater level of complexity – making the results less predictable. This unpredictable nature is what makes sport so engaging and entertaining for the viewers. Especially for sports like Football and Cricket at a given point of time at least 3-4 players will be involved. Consider Basketball where almost all players have to be involved at any point of time. For Kabaddi, at a time the no. of players involved ranges from 2-8 players during a raid (or defense). Against 5,000-to-1 odds, Leicester City FC won the Premier League title. Such unpredictability can make the sport really exciting to follow and analyse. In the book, The Numbers Game: Why Everything You Know About Football is Wrong , Anderson and Sally use evidence to show that football is a ‘weak link’ game. In other words, the success of a football team depends much more on the quality of its weakest player than the quality of its strongest player. On the other hand, basketball is a strong link game – the success of a basketball team depends more on the star player than the remain 4. It can be explained as follows – football is a low scoring sport, often an error is required to open up a scoring opportunity likely to created by the weak link. Whereas, basketball is a heavy scoring sport with the weaker players often forming the defense – the real difference is made by the player who can breach this defense repeatedly, the strongest link. Now what about Kabaddi – Best raiders will be repeatedly sent, so the difference between the teams is often the defense. Our analysis has found that there are one or two players in every team on whose getting caught, spirals the team towards an all out. Does it mean it is a strong link or weak link sport? In Season 4 of ProKabaddi League, the organizers tested waters to see if Women’s Kabaddi could draw a similar viewership. The first two matches had a viewership of more than 35 million, much higher than Euro 2016 viewership from India. If Kabaddi can become the darling of TV and media, the future does look bright. Is #kabaddi as ancient as #MohenjoDaro?? Time has come for Kabaddi to catch global attention. Kabaddi world cup starts on October 7th with the top 12 countries participating – this is first time Kabaddi World Cup will be screened on several channels, have good online presence and possible get some global media attention.